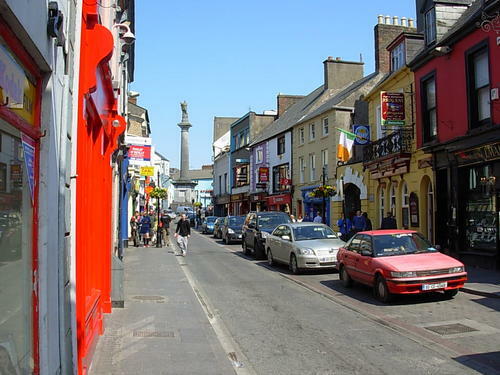 Ennis is a town in co. Clare, just south of Galway, and has a resident population of around 30,000. It can be a busy little very town in high season, easily tripling the population. 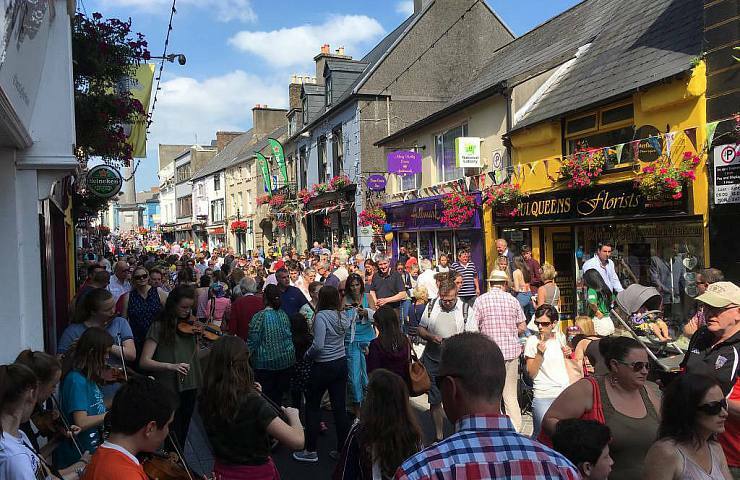 If you’re there, you’ll want to go down O’Connell Street, the heart of Ennis. 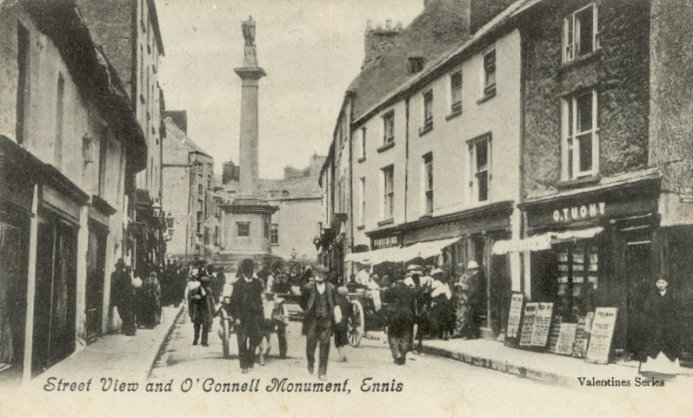 It’s a narrow, curved one-way street, lined with about seventy-seven establishments, many being period buildings, and has a distinctive commemorative pillar topped with a statue of Daniel O’Connell at one end — O’Connell was elected MP for Clare in 1828. A drink at John O’Dea’s, is a good way to start your evening. It’s been going about half a century. Dinner at Brogan’s Bar is worthy fare, though the younger crowd will likely opt for a bucket at Supermac’s (now open till 3am!). On the weekends you can usually find traditional music in the Poet’s Corner bar. You can end your night at the Old Ground Hotel, with its Town Hall restaurant, or, if you’re strapped, at the Rowan Tree Hostel. “A Night in Ennis” is most commonly played in D, and goes by quite a few other titles — what a surprise! Yet, unlike some of these other tunes, what it’s called has some onomastic payoff. That is, the name used gives you a glimpse of its historical trajectory. It tells you from whence the person learned it (or from whence the person who taught it to him/her learned it). Here’s the rub. I first learned this tune as “Sean McGuire’s” from John Doonan’s Flute For The Feis (1972). So, that’s what I called it for a while. On Mick Moloney’s LP We Have Met Together (1973), which features the inimitable fiddler Aly Bain, it was just called “Reel on Mandolin,” but on the 1983 re-release it was entitled “Dicky Sherlock’s.” It’s also called “Sherlock’s” on Danny O’Donnell’s Ón tSean-Am Anall (1977) — which translates as “from the old times.” However, if you go to thesession.org then you’ll need to look up “Jim Kelly’s” to find this tune — where you’ll find still other names for it that I’ve not yet encountered. Now, there are those, who will play it under the title “The Ash Plant,” and from that you’ll know they got it from either Lúnasa, Henrik Norbeck’s website, or from a Nigel Gatherer publication. “How’s that?” you may ask. Well, it is titled “The Ashplant” on the eponymous Lúnasa CD (1998/2001), though they played it in A, so the key is a tell as well. It is also called “The Ash Plant” on Henrick Norbeck’s ABC Tunes website, which he compiled around 1997, and again in Nigel Gatherer’s Tune of the Week, vol. 2 (2012). However, a note of caution is in order here, as the title “The Ashplant” designates a very different reel in Edor at most of the sessions I’ve been to. Still, it’s always good to notice possible sources of confusion before they occur. I now call it “A Night in Ennis” or “Night in Ennis” because someone, I don’t remember who, called it by that name at some session some years back and I wanted to avoid confusion. Interestingly, Nigel Gatherer points out on his tunearch.org website that “the ‘Night in Ennis’ title comes from the 1977 album by County Clare fiddler Vincent Griffin, who, “having no name for the reel, named it after Ennis, County Clare.” The Griffin recording is on the recently released monster 3 CD set It Was Mighty! : The Early Days of Irish Music in London (2016), a collection of recordings from 1952 to 2001.Finally, Gatherer also asserts that this tune is “perhaps best known as ‘John Brennan’s Reel,'” which is what it’s called on the Réalta CD entitled “Open the Door for Three” (2012); and after perusing Alan Ng’s website Irishtune.info that looks right. However, as another possible source of confusion, there is a very different tune also in D that I know by this name, and which is listed as “John Brennan’s” on thesession.org. As a result, I’m sticking to “A Night in Ennis” at my usual sessions. So, in consequence, these titles are a reel tell, if you’re interested in this sort of thing; but it’s a great tune regardless, and names are incidental. Hey, I didn’t say it was a BIG onomastic payoff! This article was posted in Irish Tunes and tagged Ennis, Ireland, Irish Traditional Music, Learning Irish Music, Reel. Bookmark the permalink. Follow comments with the RSS feed for this post.Post a Comment or leave a trackback: Trackback URL.